We tried to make the sound of this pedal more like tube based. As we can evaluate the sound it turned out really dynamic with deep Gain adjustments from lite crunch till brutal, hard overdrive. It has no clipping diod's schematic. Everything is based on FET Transistors. 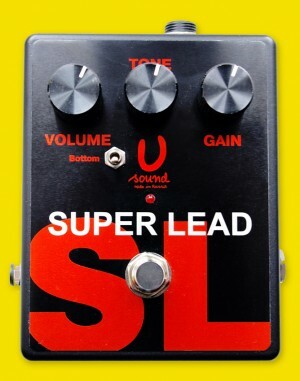 "Super Lead" tone is between Marshall JCM800. Power supply is 9-15V DC adaptor (not included) or 9Volt battary. As all U-Sound devices SL has "true bypass". Totally hand built and wired.